Charming villa holiday of 180 m 2 divided in 2 independent houses, 1 private swimming pool of 6 x 11m, 1 mexican bar, 1 corner hammock under the pine trees, all in a closed garden of 2000 m 2 with a view on a pine forest, a lot of atmosphere and wonderfully located in nature. The main villa has 3 bedrooms, 1 large living room with fireplace, 1 dining room in veranda, 1 bathroom and 1 toilet. In fine weather, meals are taken on the terrace shaded by a pergola of glycine with a barbecue area. Independent, the cottage is 45 m 2, with on the ground floor a sofa bed for 2 people, 1 bathroom with wc and 1 large room on the mezzanine. A mix of modern and old furniture with bright colors give a 'personal touch' to this house. The garden, fenced and equipped with a pond offers you several nice corners where you can sit, lay in the hammock, stay on the slightly raised lawn nearby the terrace with table and barbecue, or on the terrace by the pool surrounded by trees. A pool house with a fridge brought hand, lying on the sun loungers or the couch colored, in the company of the Sun and cicadas you you believe to the Mexico. Auriol is a charming small provencal village with its market 2 times a week. You are 25 minutes from Marseille, Aix en Provence and the beautiful Calanques of Cassis. 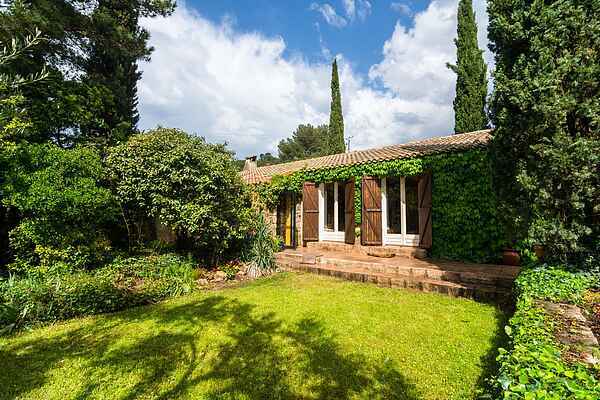 The villa is located in Roquevaire, close to the splendid the Sainte Baume Massif. Starting from Auriol by car you follow the small winding roads offering impressive panoramas. On the other side the star chain offers you with its limestone mountains and excellent opportunities for walks and bike rides.